Despite what the classic video game Paperboy taught us, the biggest threat to cyclists isn't dogs, RC cars, or random rolling tires, but the drivers they share the road with. 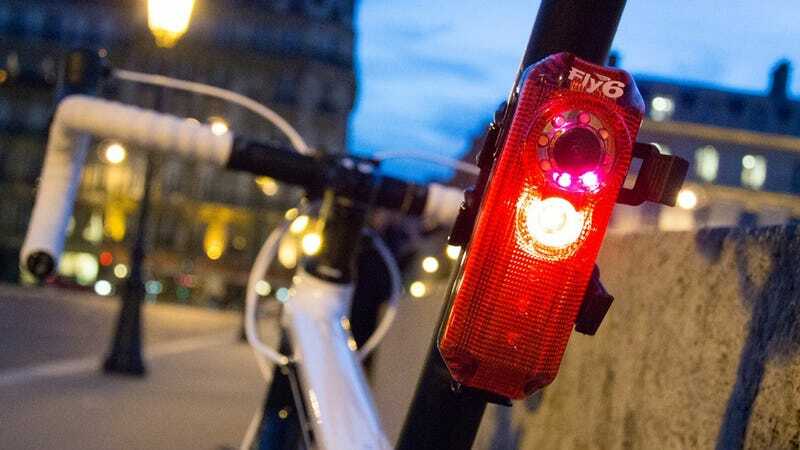 So in addition to ensuring they're definitely seen, the Fly6 bike light includes a constantly recording video camera designed to keep drivers behind a cyclist on their best behavior. But the Fly6 can't guarantee a driver won't act like a jerk or try something stupid, so on a full charge it will constantly record video at 720P for up to five hours straight. And so that it never runs out of storage space, it only keeps two hours of recorded video on its included 8GB microSD card. In the unfortunate event of an incident where the bike is tipped past 45 degrees for more than three seconds, a timer starts which keeps the camera recording for an additional hour before shutting down. And that gives investigators an hour of footage leading up to the incident, and an hour of footage afterwards.